The Germans are shipping eight supply depots to Norway: three depots to Bergen, one depot to Stavanger, two depots to Kristiansand, one depot to Drammen and one to Moss on the eastern side. Two depots are sunk en route to Bergen, and one depot is sunk on the way to Kristiansand. This is great relief to the bulk of units in Norway. Only Trondheim currently remains unsupplied, and things are getting critical. All unsupplied units are beginning their second turn out of supply. Attacks are impossible. Shipping along with the supply, two regiments and a battalion of infantry land safely in Drammen. The arrival of these supplies allows the Germans to push out of Stavanger and on to Sola Air Station. Troops in Bergen need to await the arrival of reinforcements. And antiaircraft. The Germans tighten the vice on Oslo. Reinforcements are on the way to assault the city, specifically, the 14-4 artillery regiment from Kristiansand. The Germans need this regiment, a 9-4 regiment (be it infantry or artillery), a 4-4 artillery battalion, and the German parachute companies, backed up by Panzers. In addition to this, the city has to be razed by wave after wave of bombers to disrupt as many of the Norwegian forces as possible. If this isn’t enough, the Germans will be forced to wait for some HQ units to arrive to absorb some of these units before assaulting the city. The Germans also prepare a frozen lake airfield near Hamar, just in case it is needed to get troops or supplies to Trondheim. As reinforcements are shipped to Norway, the next set of reinforcements are sent to the Staging Box. Six supply depots, and nine more battalions are ready to go, including a divisional HQ unit. 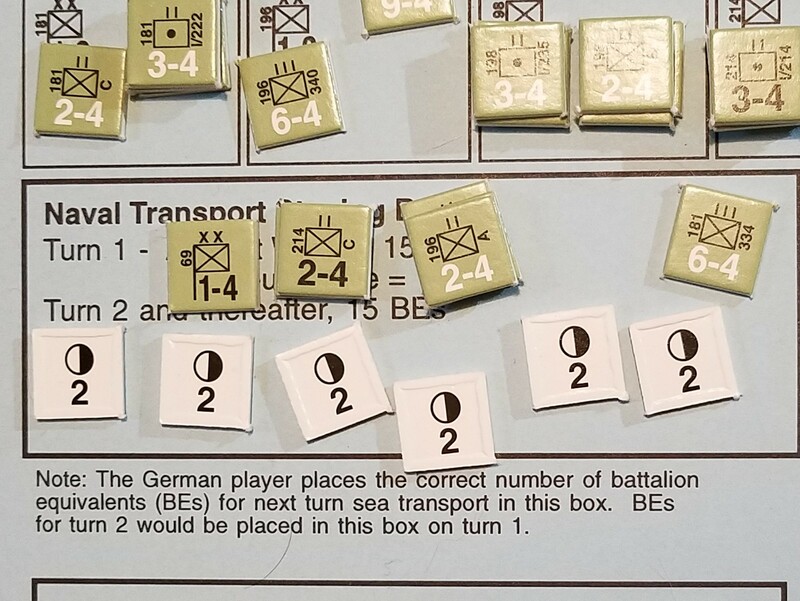 The supply situation in Trondheim dictates the Germans take a risk and send the long range He-115Bs into Trondheim unescorted. While they fly this mission, groups of Ju-52s fly supply over southern Norway and drop it to the troops below, at Kristiansand, Fornebu Air Station, and Drammen. Of course, the Norwegian Gladiators leave the newly reopened Værnes Air Station and intercept the He-115s, hoping to disrupt the supply drop. Unfortunately, they are attacking at 1:2 odds, and fail to take down a single supply toting bomber. The bombers, on the other hand, completely eliminate the Gladiators, then land at Trondheim to debark their their cargo. Because the planes have landed, they are parked here until next turn. 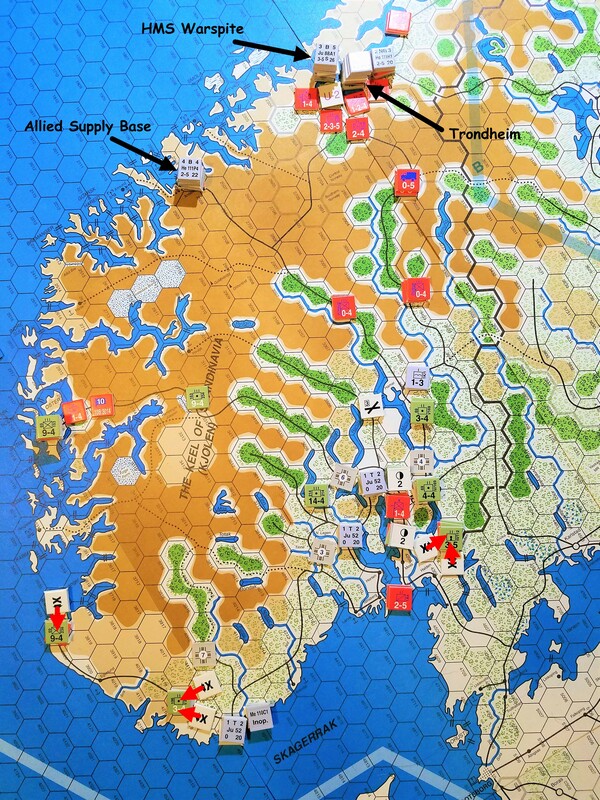 While supplies are being dropped, the Luftwaffe bomber arm decides to target the British supply base in Andalsnes, the HMS Warspite, and Værnes to shut it back down. A 5 strength group of AA cruisers are protecting the supply base, and another group of 5 strength AA cruisers are sailing with the Warspite. Unfortunately, for the Allies, the AA fails to bring down a single air unit. The German bombers also fail to hit the supply base. The Warspite, or one of the accompanying auxiliary ships has taken a hit. It looks like the anti-shipping bombing code has no bearing on this game. It looks like it is a Europa level code. The hit subtracts 1 victory point from the Allied total, dropping the Allies to 22 victory points. The raid on Værnes is much more successful. Three bombing runs inflict three hits on the airfield, shutting it down for several turns. An attack on Sumburgh airfield, in the Shetland Islands is also raided. The airfield is protected by a Blenheim 4F heavy fighter and the three Skuas from Hatston Field. Both sides have an air unit eliminated, and an air unit aborted. Aborted, in this game as opposed to normal Europa rules, seems to actually mean the air unit has been returned. There is no mechanism for repairing aborted aircraft, and it appears from the rules, that an aborted aircraft returns to base and can no longer take part in any missions this turn. Drawing randomly, the British lose a Skua fighter, and the Germans lose an He-111P. The Allies gain another VP, but lose 2 for the loss of the Skua. Allied VPs now stand at 21. The target is the British Whitley 5 on the ground. The interception, though, was enough to throw the bombers off their targets, and they miss, badly (rolled a 1). On the ground, the Norwegians at Sola withdraw fighting, giving up the airbase but remaining intact. Over near Kristiansand, the withdrawing 3rd Brigade HQ is eliminated, but they put up a spirited defense and get a Half Exchange. Yes, the Norwegian HQ successfully eliminates a German battalion before being eliminated themselves. Far to the east, the Norwegian artillery doesn’t stick around for the fight. They wisely pack up and withdraw. Yes, the Germans left Stavanger wide open. I did that deliberately. I’m not including, or commenting on the Narvik front at this point because the Germans are just holding their positions at the moment. 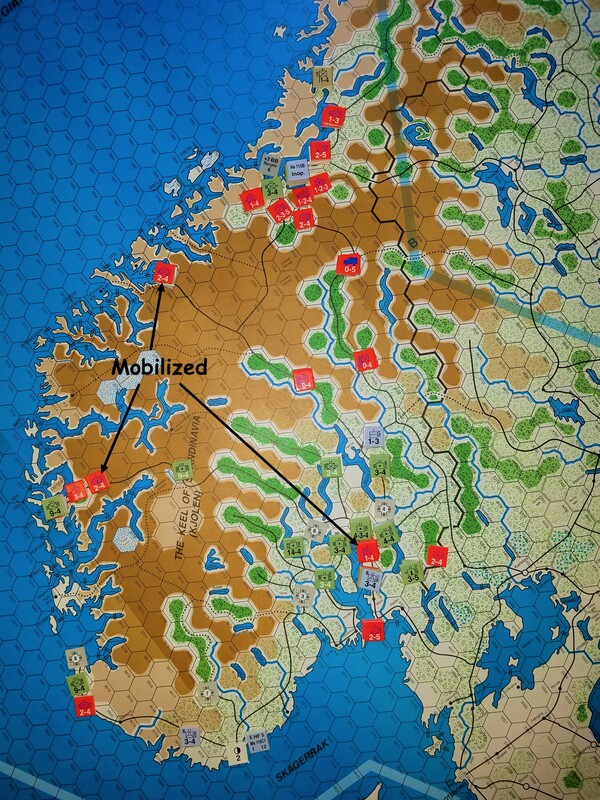 The Norwegians mobilize 7 battalions this turn (the maximum). Unfortunately, 4 of them are captured on mobilization. 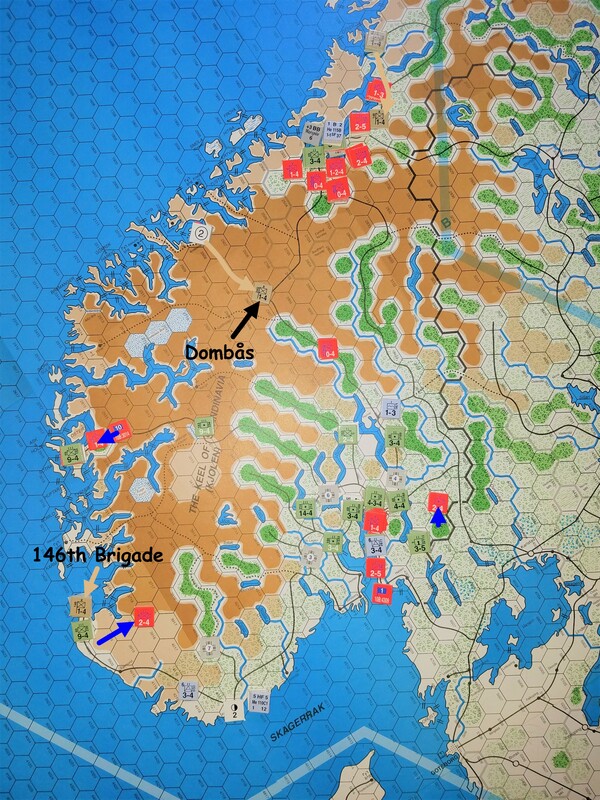 Battalions arrive at MC 2, 10, 11 and 14 (Oslo, Bergen, Andalsnes and Mosjoen). The British also have another brigade ready to go, as do the French. A Royal Navy AA battery is landed at Andalsnes to assist in the defense of the supply base. The French land a mountain infantry regiment and a supply base at Harstad, near Narvik. The British 146th Brigade and a supply base are landed at Stavanger. The thought process behind this landing is that this will create a supply base closer to German bombers, and take some pressure off the supply base at Andalsnes. The Germans will relentlessly target these bases. 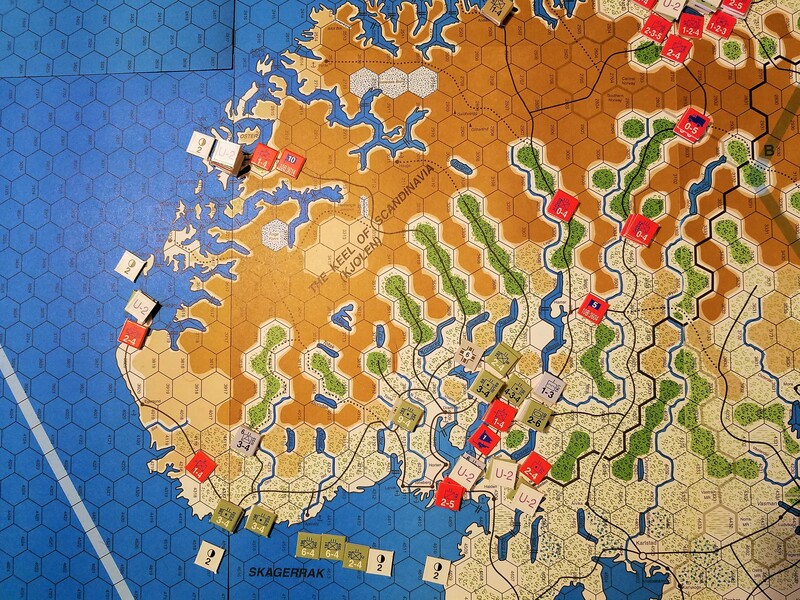 Norwegian units in the arctic continue their trek towards Narvik. Norwegian reinforcements arrive to continue reinforcing the Trondheim area. HQ units begin absorbing combat units to allow more stacking. 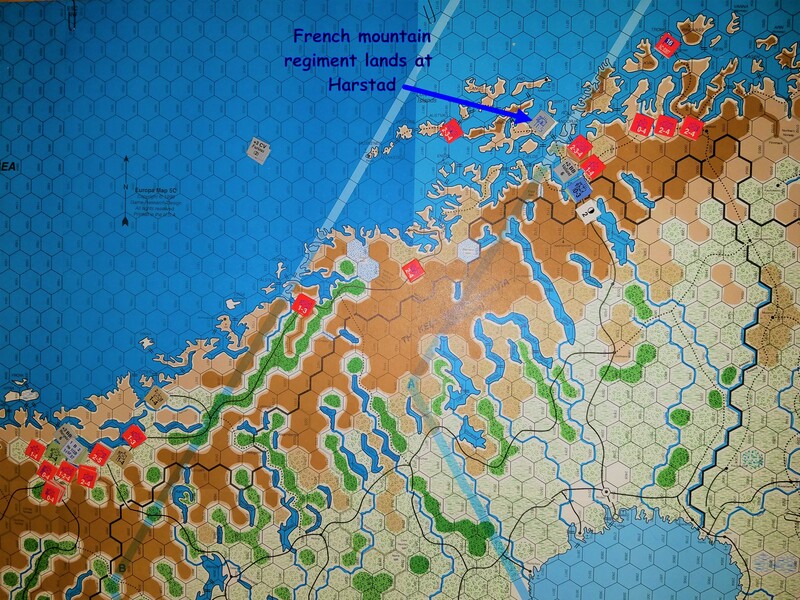 The British 24th Guards Brigade moves south the Dombås, the rail junction just south of Andalsnes and take a blocking position in the mountains. The battalion that held onto Stavanger and Sola Air Station withdraws into the mountains. Anything to make the German campaign difficult. Since Oslo has been reinforced, and it is surrounded (pretty much), it creates a conundrum for the Norwegians. 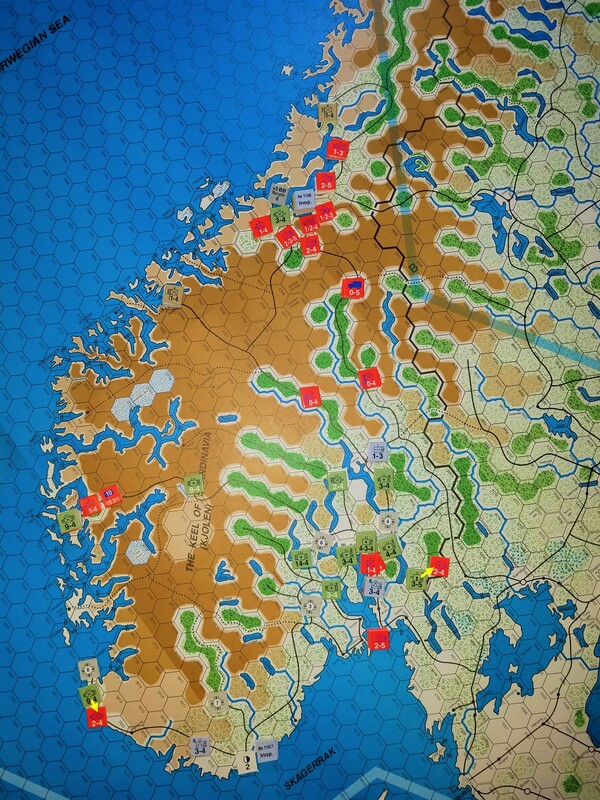 Should Oslo continue to be held and force the Germans to take it, or should the Norwegians try to break out and establish a front line and try to slow the German advance on Trondheim down? Examining the possible escape routes, there is an open route to the south. If the Norwegians abandon the city and move south, just to the east two mountain artillery battalions and an infantry battalions bars the way to the north. The King’s Guards are, for all intents and purposes, trapped. After much deliberation, and consulting with the oracles, it is finally determined once and for all that the Norwegians will make their stand here. If the Germans want the city, they must take the city, and hopefully the cost is high. The Luftwaffe raid on Sumburgh, though it missed, fires up the Royal Air Force. Night raids are conducted against the newly captured Sola Air Station, and day raids against Bergen. Three hits are achieved at Sola, shutting the airfield down, while no further damage was done to Flatøy at Bergen. It is difficult for the Norwegians to fight back against the Germans. The Allies tend to be a bit loathe to risk the British/French/Polish units too much. The only two places the Allies can really fight back are at Oslo and Narvik, and Oslo can only make the price of capturing the city as high as possible. Far to the north, the Norwegians have made contact with the Germans in Narvik. Troops are moving up from the south as quickly as possible, and the French have arrived. While the supply situation has been resolved, the Germans face another dilemma; how to take Oslo. I’ve figured out the solution, and the solution should have always been obvious from the beginning. It was so obvious, that it is the solution for taking Oslo during the first turn invasion. This is why you play certain games repeatedly, to learn these things. I’m not giving the solution in this post. That will wait until the next turn. Eagerly waiting for the next post . . .